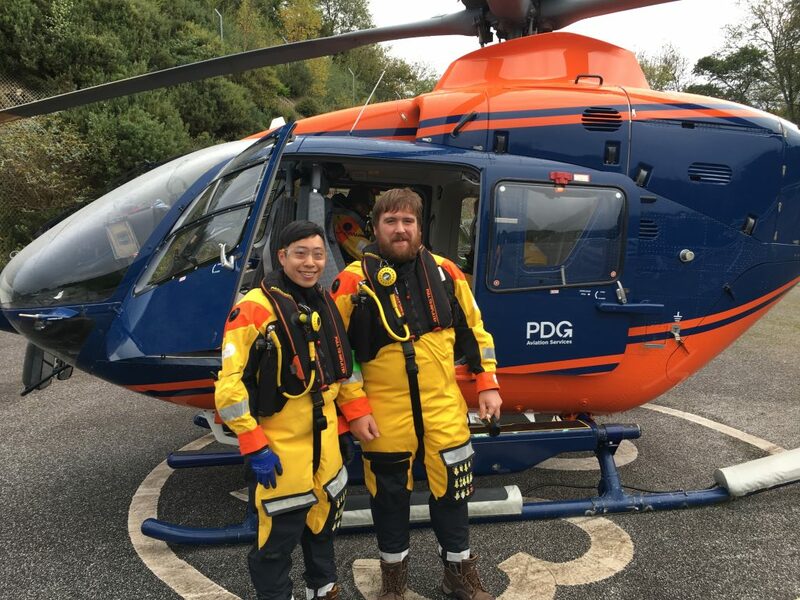 Last month a STORMLAMP team (James Brownjohn and Vincent Ao from University of Exeter and Alessandro Antonini and Trevor Bevan from University of Plymouth) carried out the tests on the 49m tall, 12 storey Eddystone lighthouse. This was the final test in an experimental campaign that has also included lighthouses off the coasts of Guernsey, Cornwall, Ireland and Scotland. Having flown to the lighthouse by helicopter from Castle Air in Liskeard, the team set up carried out tests on the helideck platform, using four horizontal accelerometers to characterise the in-plane rigid body behaviour, while heel-drops were used to check the out-of-plane natural frequency, showing the helideck behaves like a high frequency floor. The extensive information about the helideck should permit detailed study by finite element analysis. In addition, they took measurements, including single measurement of the whole structure overnight. High quality modal identification was obtained using a combination of shaker and ambient testing to characterise both the granite structure and the helideck.